John Kerry’s April 29 deadline for a negotiated framework between Israel and the Palestinian Authority, is only a few weeks away. Without waiting for what is still a “flexible” end point for this round of “peace talks”, the two negotiating parties have entered the “blame game” utilizing the weapons they have at hand. One party has the military and police strength of a major world military power. The other has the power to sign 14 international treaties, which include the Geneva Conventions and treaties on racism, genocide, and civil and political rights. “Everything that has happened to Kerry’s initiative this week was smeared in block letters on every wall en route to this impasse that we have just reached. What we had here was a foretold chronicle of a breakdown on one hand, and a sweeping and somewhat childish enthusiasm with which Kerry sank his teeth into the negotiations on the other. Had Caspit studied and examined the two films he slips into his report, he would have discovered that Cool Hand Luke and the Mission Impossible series witness to the familiar reminder that “the arc of history bends toward justice”. Luke’s spirit outlives the oppressive warden that treated him so brutally. Tom Cruise’s “missions impossible” all focus on one man’s victory over stronger adversaries. Captain: Don’t you ever talk that way to me. (pause, then hitting him) NEVER! NEVER! (Luke rolls down hill; Captain speaks to other prisoners) What we’ve got here is failure to communicate. Some men you just can’t reach. So you get what we had here last week, which is the way he wants it. Well, he gets it. I don’t like it any more than you men. Martin Luther King, Jr., who was assassinated at the Lorraine Motel, in Memphis, Tennessee, 46 years ago this past Sunday, referred to the “arc of history” in a speech he gave to the Southern Christian Leadership Conference on August 16, 1967, eight months before he was killed. Martin Luther King, Jr. made these words famous to a new generation a century later in his “Where Do We Go From Here?” speech to the Southern Christian Leadership Conference. “Let us realize that the arc of the moral universe is long, but it bends toward justice. Let us realize that William Cullen Bryant is right: “Truth, crushed to earth, will rise again.” Let us go out realizing that the Bible is right: “Be not deceived. God is not mocked”. King’s enemies, and there were many, could not dim the spirit nor the influence of a man who reminded us that “God is not mocked”. The movement King led brought down the walls of segregation. That “security wall” Israel claims it needs for its protection, will be brought down as well, along with the occupation it symbolizes and enforces. This end of one more chapter of the “peace process”, is certainly a failure of the participating parties. It is not, however, the final word on the subject. The picture of Secretary of State Kerry is from the Guardian. It was taken by Jacquelyn Martin/AFP/Getty Images. This entry was posted in John Kerry, Middle East Politics, Movies, Netanyahu, USA. Bookmark the permalink. man. Makes me want to dig out his sermons/essays. 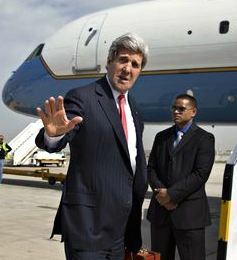 When Secretary of State, John Kerry, boarded his first plane ride to Israel, it was obvious that Israel’s minimal demands had already been embedded in the grinding “Process of deceit”, or what I prefer to call, “the Processed Piece-meal”. In fact, from what was leaked out to the media, regardless of what was mouthed by the Kerry Party, Israel was pretty much chewed-into the “Kerry Meal Combo” award, composed of East-West Jerusalem Salad, generous clusters of West Bank settlement Nuggets, Israeli crisp-Fried Palestinians, and a Free large Bottle-neck of Jordan Valley Water. The Kerry Team also ran the “Israeli-Monopoly Promotion”, with new-improved game-board design, with board squares branding Israel as a “Kosher Jewish state”, as a “nuclear arsenal monopoly”, and cleansing out the former square named Palestine. President Abbas probably now realizes that the dice was rigged from Day One. Perhaps he knew it all along, but just wanted to see how far they will go. It is now 11 O’clock, just one hour before midnight. President Abbas,The Hague is awaiting your knock on ALL, yes ALL, their door knobs. Please do not ignore even one. Israel has not negotiated in good faith. Building settlements all over the West Bank and East Jerusalem is proof of this. If they wanted a two state solution, they would not have been doing this for the past forty years. It’s time the talks for two states ended. There is not enough land left for a Palestinian state. Israel has taken most of it Palestinians need to struggle for equal rights and an end to the apartheid state. The Israelis will fight to prevent this. Israel has chosen to have an apartheid state, and they have the US government in their pocket. The Israelis, or Netenyahu, are simply and arrogantly determined to get the whole Jordan valley, they have no idea of cooperating or sharing. They got their land by criminal means and will continue to do so. Their minds are made up, they don’t collaborate or reason, that should be pretty obvious, and how are the Palestinians, helpless and unarmed, and with Israel constantly rewarded by the U.S., HOW ARE THE PALESTINIANDS TO CLAIM A JUST SOLUTION?